In this tutorial, we will show you how to enable https in WordPress, so you can connect to your website securely over SSL. For more information, see our guide titled "What is SSL and why is it important?" WARNING: You will need an SSL before attempting to complete this tutorial. NOTE: All of the Business Class Hosting plans offered by InMotion Hosting include a Free SSL. In the WordPress Address (URL) field, enter your https address. Enter your https address in the Site Address (URL) field. WordPress advises "Enter the address here if you want your site homepage to be different from the directory you installed WordPress." Click the Save Changes button on the bottom. You are finished when you see a "Settings saved" message. Congratulations, now you know how to Enable SSL in WordPress! You will now be able to connect to your WordPress site over an SSL connection. Hi there, and thanks for taking the trouble to help us all. I have a wordpress site hosted with bluehost and they give a free SSL. Can I follow your instructions and get my site to show "secure" in the URL bar? My site is at ****. Thank you kindly for your advice. Gerald. You should be able to follow these instructions with any WordPress website. In order to get your site secured, I recommend using the website WhyNoPadLock.com to run a scan of your website. This will help you identify the security implementations that are required for the padlock to display for your website. I hope this helps! all the things working fine. i have create my own email id in cpanel it was successfully created and send mail to anyone . but i can't receive email. anyone send me mail to that time show aunthanticated. I'm sorry to see that you are having issues receiving emails. I recommend using our guide for assistance with "Changing MX records to point to InMotion servers from third party DNS." I hope this helps! Is it possible to get Free SSL to work with a wildcard? No, a Free SSL will only be installed if it passes Domain Control Validation. However, you may be able to install a Wildcard SSL Certificate from a third party. Please help me.. One wordpress site cannot be opened unless i add an ssl exception.. How do I get over that so that my site can be accessed by other users without any disturbance? From the information in your question, it's possible there's an issue with the SSL itself or the URL being used to connect to the site. If you have more information, you may share it here or contact our Live Support team so they can replicate the issue and troubleshoot it with you. well, my Setting->General page does NOT have a URL field! where is it? That field is a normal part of a stand-alone WordPress installation. If you don't have it, then either you're not looking at a stand-alone installation of WordPress or you have plugins or some other modification of WordPress that is affecting that particular entry. My suggestion is to first troubleshoot by disabling your current plugins and if the problem persists double-check your installation for updates. 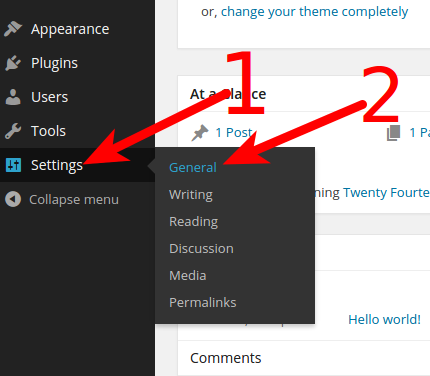 If you still have issue, I would recommend going to the WordPress Support forums for further assistance. after changing url from www to https:// in wordpress admin panel. Still website don't have secure connection..can you please help me to solve this issue. If your page is displaying mixed content (secure and insecure) the padlock will not display. Often, doing a find and replace in the database can correct this. There are also plugins available for accomplishing this from the WP dashboard. We are happy to help you troubleshoot further if you can provide a link to the website. It is likely that there are certain URLs within the site that are not using "https" protocol. There is a website called Why No Padlock? which scans the site and isolates these instances, so they can be updated. Most often, the "insecure" elements turn out to be image links within posts or pages. I mistakenly followed these directions before actually installing the SSL. Now I am locked out of the WP admin backend - my browser keeps redirecting to https which, of course, will not work. Please help. Yes, you can reverse this by editing the WP config file. You can follow directions on changing the site URL from WordPress. Hey, if you are using Wordpress and have activated a ssl certificate, you can use a free plugin: Really simple ssl. That will fixe the image links. This did part of the job for me, but I ran into two issues: 1) After switching to HTTPS my images wouldn't load, and 2) The address bar in my browser showed the "not fully secure" icon. 1) I use MaxCDN as my CDN. After changing my site address to https in Wordpress, none of my images showed up and my stylesheets didn't load. So I knew something was wrong with my CDN. Turns out I had to go into my MaxCDN account, go to my Pull Zones, edit my zone, go to the SSL tab, then Shared SSL, then Enable. After that, I had to go to my W3 Total Cache plugin settings in wordpress, go to CDN settings, and paste the URL that MaxCDN gives you as the "SSL" CDN URL. LOL. 3) My theme had some Google Font addresses hard-coded into the functions.php file. I had to change these to https:// manually using the Theme editor in wordpress. After that, my site displayed the green Secure icon next to the address bar (see it live at https://*************.com ) instead of the exclamation point icon. Thank you kfiretvadmin, I was having that problem and had no idea where to start fixing it. Amora, we're glad to hear that you were able to resolve the issue! We are happy to help you troubleshoot further, but will need some additional information. Can you provide a link to your site for us to test? If our Support technicians installed the SSL they will be happy to take another look to see if something may have happened. I advise you contact Live Support for more information regarding the SSL installation. Or, if you have any comments or questions about the steps in the article above, using https with Wordpress, let us know. You can stop using the SSL by using the following lines in your wp-config.php file. I couldn't access into my dashboards after accidentally change HTTP to HTTPS. fixed the access problem, now I don't have any plugins installed. Not sure how changing the URL to use HTTPS would remove your plugins (or your access for that matter). If you have a security plugin causing the issue with access - because of the change, then it's possible. You may need to re-load your plugins because of the change in path, but I would double-check your WP site to make sure that it is functioning properly with the HTTPS path before proceeding. Hi there. This feature does not work - in my Wordpress install I cannot see an option to edit the site URL. It's all greyed out. Thank you for contacting us. I recommend checking/setting your WordPress URL in the wp-config file, or in your database.